Having rebuilt completely from the ground up after a devastating fire in April 2016, Superking Seafood is back to regular business hours beginning today. The business, at 411 W. Thomas St., in Hammond, held its ribbon cutting and blessing ceremony Saturday morning. 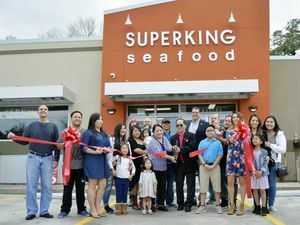 The store will be open today 9 a.m. – 8 p.m. and Monday thru Saturday 8:30 a.m.- 7:30 p.m.
Superking Seafood is owned by Trung and Dau Nguyen and operated with their sons, daughters and their spouses: Francis (Maria) Nguyen, Tuan Nguyen, Duckie (Thuy) Nguyen, Tina (Trey) Warren, and Linda Nguyen. The Nguyen family has served boiled seafood and lunch plates at the business for the past 25 years. The fire last year also resulted in damage to the restaurant next door, Lee’s Diner. Both establishments had to close for repairs. Superking, however, had to be scrapped completely and rebuild. Fortunately for the business owners, Nguyen said the August flood did not affect the building process. He said at that point, paperwork was still being processed and construction had not begun. Nguyen said the old building was built in the 1950s and was an old gas station that they added on to. He said because of that, nothing was in the “right places” and it made work harder. The new building has a new layout and is better for work, he said. “It’s night and day with this building,” Nguyen said. The business is a little larger than the old structure, according to previous reports, but it appears much larger from the outside because of the two rental spaces connected to the business. Nguyen said shoppers can look forward to a few new items on the menu.